April 9, 2019 – It’s not uncommon for whisky makers to team up with actors and filmmakers on a project. The not uncommon result, though, is usually a very expensive commercial for the whisky. Fortunately, that is not the case with “Four,” a short film directed by Jennifer Sheridan and produced by Platform Presents with funding from Dewar’s. The film was co-written by John Hopkins and Tuppence Middleton, who also stars along with Iwan Rheon, Jack Farthing, Juliet Stevenson, and Nicholas Pinnock in a throwback to the classic “noir” mystery films of the past. Set in London’s Savoy Hotel, the film focuses on a mysterious brooch that brings together a young couple, a mysterious man, a dowager living at the Savoy, and the hotel manager trying to collect on the dowager’s long-overdue bill. Needless to say, the manager is the only one who isn’t hiding a secret – for most of the film. (No spoilers here.) “Four” is available to view online, and will be screened at a number of film festivals in the coming months. “We literally got one thing for our brief, which was the number four, and then we were set free with it. We could run wild and really create whatever we wanted, which is quite a rare thing that you’re given that opportunity and you can completely invent something,” Middleton said in an interview at the premiere of “Four” last Thursday night in New York City. She currently stars in the Netflix series “Sense8,” and this was her first screenwriting project. “You read scripts every week, and so I had gotten very used to reading something and knowing if I liked it or not and what worked and what didn’t, but hadn’t quite gotten around to the point where I’d finished something in its entirety and then given it to someone and said ‘what do you think’ or ‘would you like to make this?” So, when Bella (Isabella Macpherson), our producer, came to me and said ‘do you fancy giving it a go,” it was like, yes I do and what’s the worst that could happen,” Middleton said with a laugh. There is a connection to the Dewar’s brand history hidden within the film, as well as a bottle of the 21-year-old Dewar’s Double Double whisky shown in the dowager’s room at the Savoy. The legendary Tommy Dewar, one of the sons of Dewar’s founder John Dewar and well-known for his global travels to promote the brand a century ago, made his home in London at the Savoy Hotel for many years before his death in 1930. Because of that history, the hotel’s current owners were eager to host the cast and crew for several days of filming. “With consumers thirsty for deeper storytelling, our short film “Four,” a first for Dewar’s, not only demonstrates the brand’s timelessness within the whisky category, but cleverly captures its more premium side,” Dewar’s Global Brand Director Zeenah Vilcassim said. The Dewar’s “Double Double” range of Scotch Whiskies. Dewar’s used the film’s premiere to help launch its new “Double Double” range of blended Scotch whiskies. 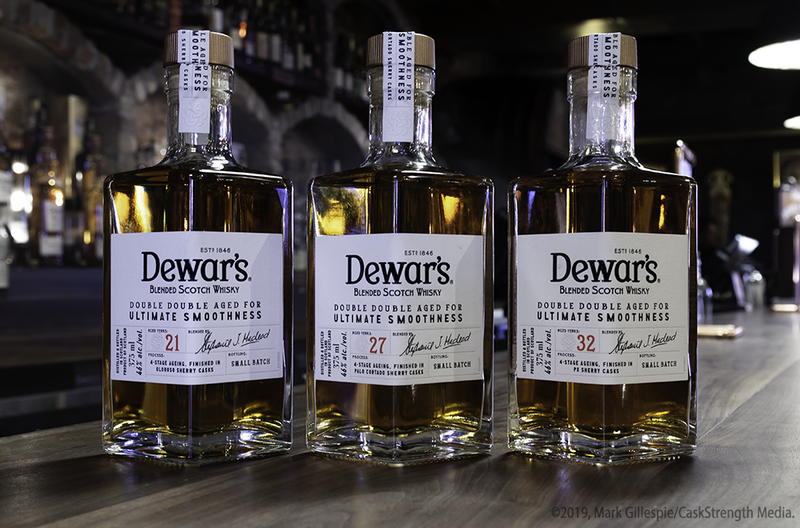 The “four” reference came from the four-stage aging process Dewar’s Master Blender Stephanie MacLeod used to create the three unique whiskies in the series after researching the company’s archive for inspiration. “A.J. Cameron, our first Master Blender, blended the malts by their regions, put them back into oak casks and let them set for a while, then blended them with the grain whiskies,” MacLeod said in an interview. She tweaked the process by blending her component malt whiskies and grain whiskies separately, and then letting the two blends marry for a month before bringing them together. After that combination married for a month, each of the three whiskies went into a different type of Sherry cask for a final period of maturation. The 21-year-old version went into Oloroso casks, while the 27-year-old was filled into Palo Cortado casks and the 32-year-old used Pedro Ximenez casks. While Middleton’s next film project will be the film adaptation of “Downton Abbey,” she also has another project in mind – one that involves her growing love of whisky.